When Spider-Man assigns to attack, you may pay to force every opposing character to block him if able. If Spider-Man: Webslinger attacks and his ability is used, the opponent cannot use the Distraction global ability to reassign blockers to other attackers ("Pay to remove one attacker from the attack zone to the field"). During the Attack Step, other than global abilities that respond to a specific trigger, such as global abilities that prevent or redirect damage, the defending player may only use global abilities after attackers and blockers have been declared. In this case, the defending player would not be able to use Distraction’s global ability to remove Spider-Man from the attack zone until after blockers had been declared. As a result, there would not be an opportunity after Distraction’s global ability had been used to assign the characters that were formerly blocking Spider-Man to block different attacking characters. 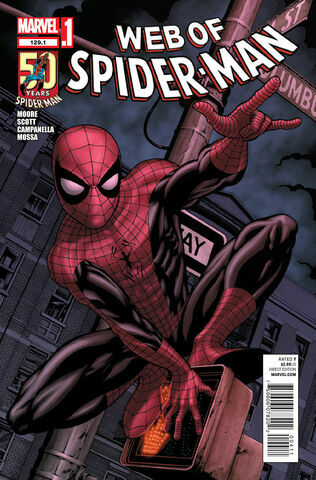 ^ Web of Spider-Man Vol 1 #129.1. Marvel Database Wikia. Retrieved 29 July 2015.